﻿I'm back to the Twisty Puzzles, and this time I have a very cool little one, the Snow Mystery. 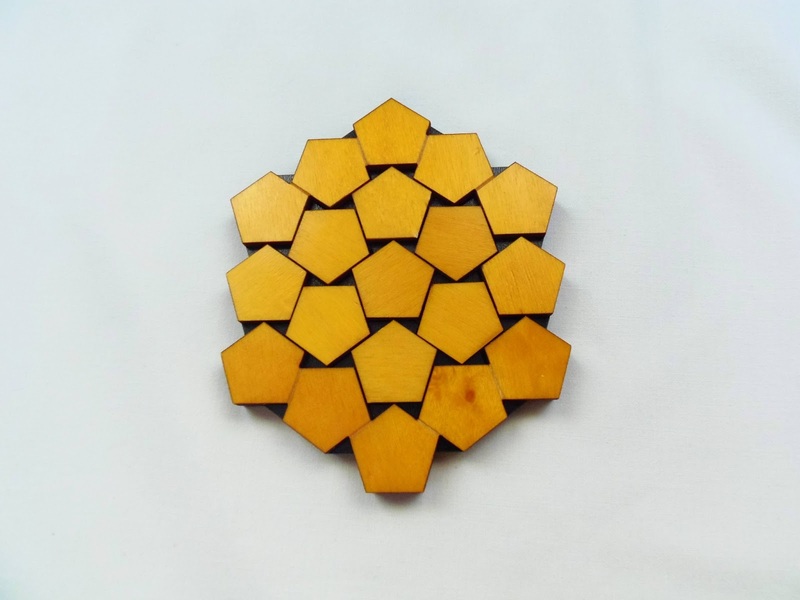 It was designed by Leslie Li from Very Puzzles and it's classified as a dihedral puzzle. 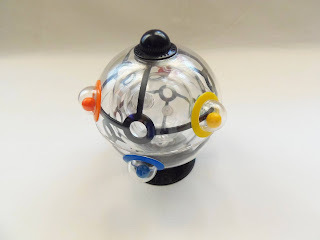 It is closely related to the Rubik's UFO, although the mechanism is completely different. Solving wise, I believe the Snow Mystery is easier to solve as well. The colorful design of the puzzle and its snowflake shape captivated my attention right away. Usually, I'm easily thrown off by the extreme difficulty of most Twisty Puzzles, mainly because I'm not very good at solving them and hate to learn algorithms, but this one seemed simple enough to try. I was able to solve the UFO in a relatively short time and didn't find it that much challenging, so I figured this one was right up my alley. It's quite small compared to other Twistys though, with a diameter of about 7.5cm (3"). The puzzle consists of two layers with six rotating arms. Each arm has the same color on the front and back, and after you mix it up, you have to return each arm to its corresponding color. In addition to the rotating arms the two layers can freely rotate horizontally. It's a little difficult to rotate the layers at first, because the puzzle can easily lock-up if the arms are not fully aligned. A simple way to manipulate it is by handling it with your fingers in the spaces between the arms. That way, you avoid even touching the arms and prevent lock-ups. The Snow Mystery comes packaged unstickered, so you have to do it by yourself. Don't worry, you don't have to cut anything, because each color sheet you'll be using is already pre-cut with the exact shapes. 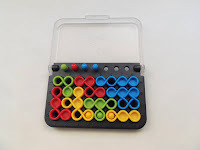 You'll be needing six different colors for the puzzle, but luckily, if you don't like some of the colors you see in mine there are a total of ten colored sheets included, so you can choose any combination of six colors you like. 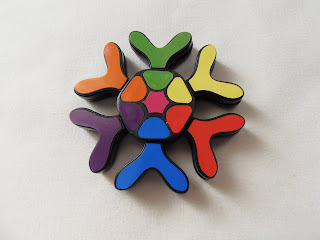 As you can see in mine, the center of the puzzle has a seventh color, with an eighth on the back. This is completely optional though. If you prefer to leave the center blank, you can do so. It's merely for aesthetic purposes. The solving process, as I was expecting was rather simple. Logic alone, without any use of algorithms is enough to solve it. It's not very challenging, but still tricky as with most Twistys. If you're an experienced solver, you won't find it much fun, so it's basically a collectible. The Snow Mystery, despite being very easy to solve is a great puzzle to add to the long Twisty family. In a category of puzzles where "similar" is a frequent adjective, I found it to be quite original and unique. Highly recommended to any Twisty aficionado. Availability: You can get the Snow Mystery at PuzzleMaster for $15 CAD. Looking at some of the puzzles made by the company Siebenstein-Spiele, I think I know why I find them so fascinating. 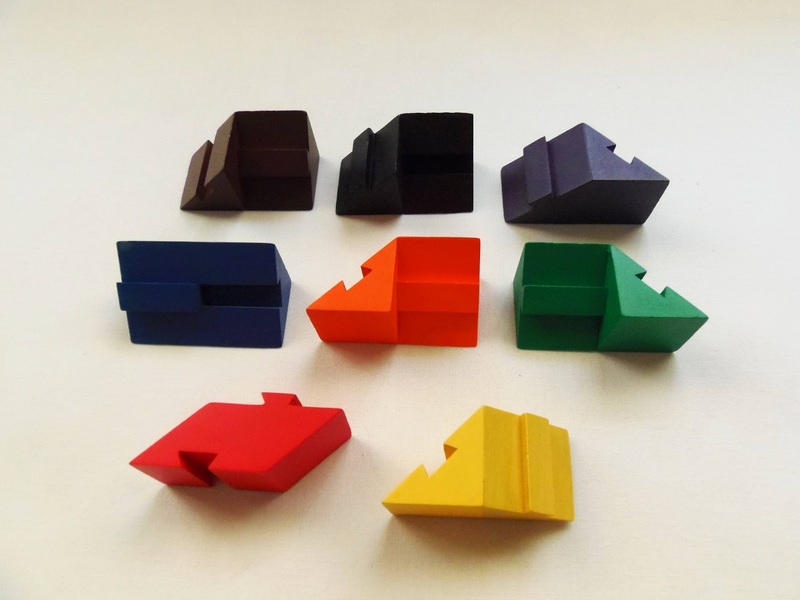 They are very similar in concept and appearance to some of Jean Claude Constantin's puzzles. 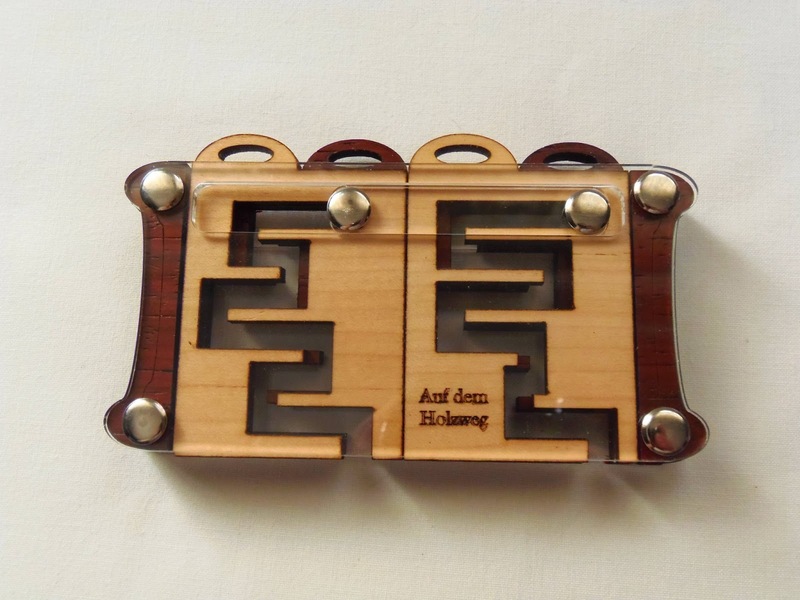 Acually, they also produce puzzles designed by Constantin, but the majority of them are designed by Jürgen Reiche. 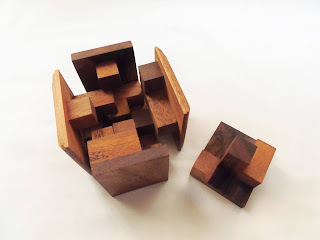 The puzzle Auf dem Holzweg is one of such puzzles that closely resembles one of Constantin's designs, but at the same time is quite different in its own way. Auf dem Holzweg can be translated into English as "on the wrong track". It's a rather fitting name, as you'll find yourself backtracking quite a lot during your attempt at solving it. Related to Constantin's Kugellager, the goal is to remove the two pairs of boards by constantly moving the slider left and right, and pushing and pulling the boards up and down. 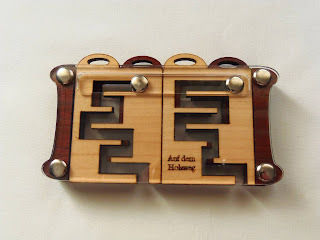 Both Kugellager and Auf dem Holzweg are classified as n-ary puzzles, with the former being a 5-ary and the latter a 3-ary or ternary puzzle (read more info on n-ary puzzles here). 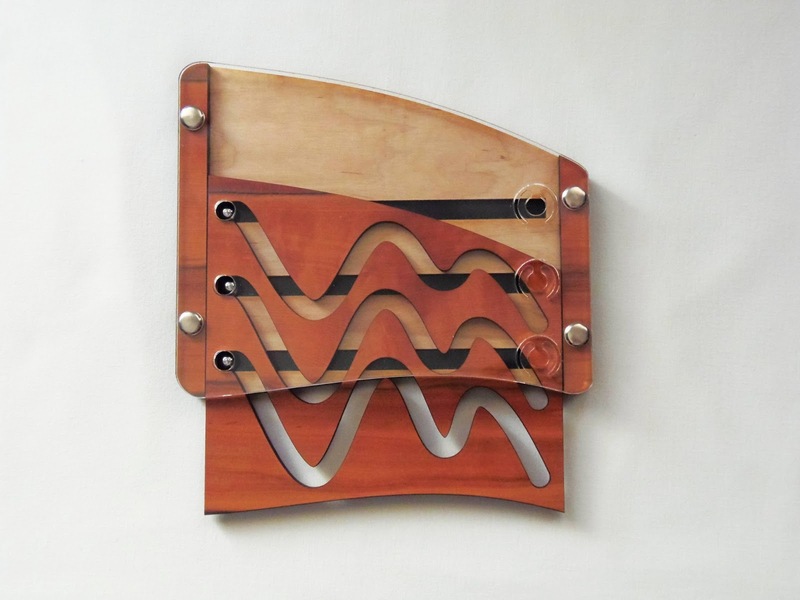 The design of the puzzle is very elegant, made by a combination of wood in the boards and acrylic on the frame, front and back. It measures 13 x 6.5cm (5.1 x 2.6"), so it's relatively small, but still very easy to manipulate. The mechanism of the puzzle is very simple, but quite functional. At first glance, it appears as if the two pins move independently, when in fact a slider is connecting the pins and moves as one. By moving only in one direction at a time, you need to constantly plan what moves you need to make in order to advance, and sometimes that means taking three steps back to take one forward. 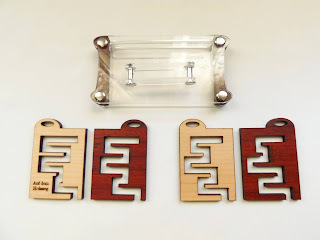 Both pairs of boards have different mazes, and even each pair has two different boards, meaning you are manipulating four different mazes simultaneously. I didn't find the puzzle too difficult, but only because I have solved a few of these n-ary puzzles before. It took me approximately 15 to 20 minutes to solve. I didn't count the moves it took, but they were much less than the Kugellager's 1250 moves. If you think that's too much, try the Kugellager 7 with its staggering 4802 moves. I didn't have the patience to put it back as it was yet, but I think I'm going to cheat and disassemble it. I prefer to solve them from their original state rather than the other way around. Looking at the boards out of the frame, I wonder if it's possible to interchange the pairs of boards and if it would still be solvable. My guess is you can, but I'd have to test it to know for sure. Not entirely certain if you can mix all four of them that freely though. If you like n-ary puzzles, Auf dem Holzweg is a superb addition to your collection. 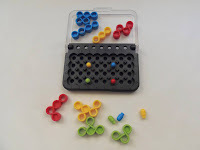 If you plan to solve more complex puzzles like the Kugellager, this is a perfect candidate to practice. I will definitely keep my eye out for more puzzles from Siebenstein-Spiele. Availability: Auf dem Holzweg is available from Sloyd.fi in Finland. Dragon Cube is a fascinating little puzzle from the folks over at Gotta Solve It. Invented by their chief mechanical puzzle engineer, Doug Engel, the Dragon Cube is able to transform itself is several different shapes. This was first introduced in 2000 as an exchange puzzle at the 20th IPP, then called Perfect Ring of Eight. 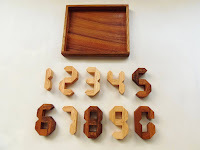 The puzzle is built from wood and painted with eight different colors, producing a very nice visual effect. Although I prefer wooden puzzles, in this particular case I think plastic would have been much more appropriate, since you're dealing with colors. Paint and wood don't always go well together, because you're more prone to imperfections. Nevertheless, the coloring was very well done and you can hardly notice any spots or blemishes. The cube is also quite small, with 5cm in diameter (2"). 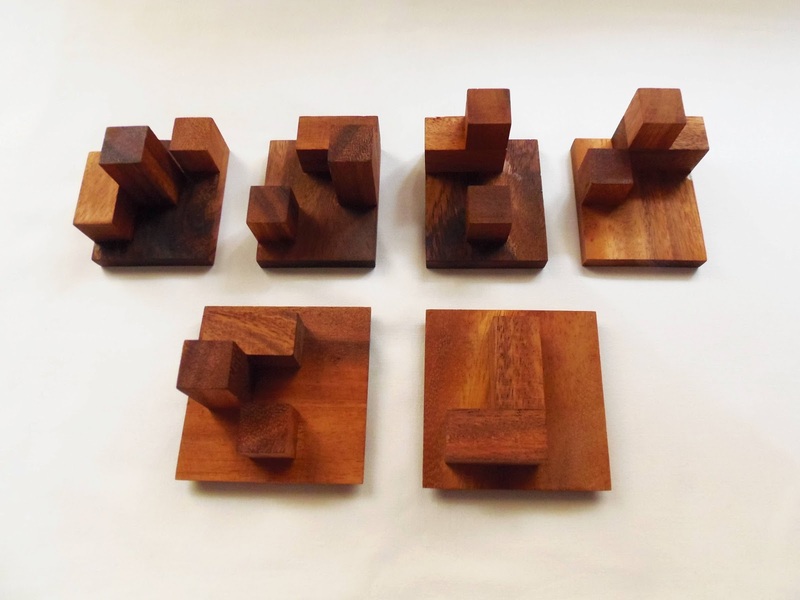 Consisting of eight different dovetail pieces, your first task is to take the cube apart. 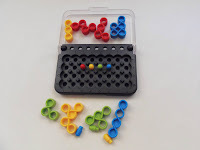 You can easily do this by removing the pieces in pairs, instead of trying to separate them one by one. 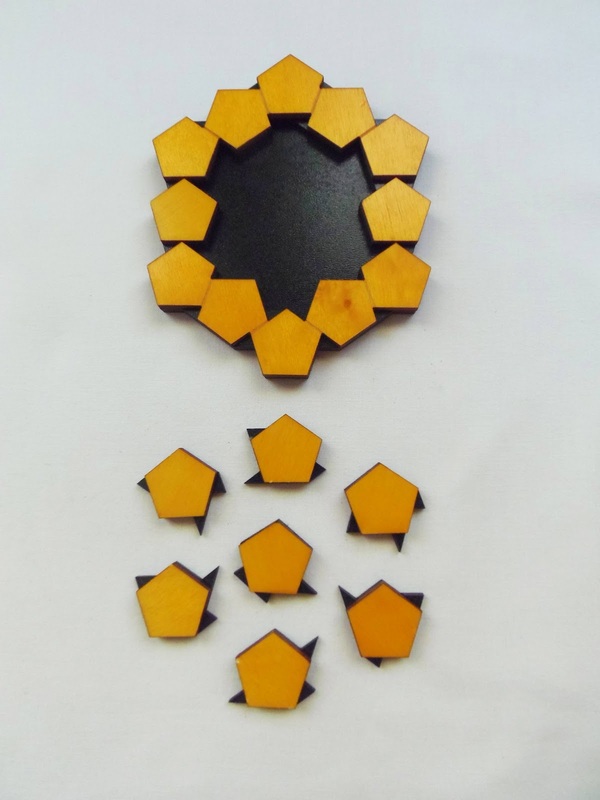 Once you have all eight pieces removed, there's a total of 14 shapes you can try to assemble them into. They vary in terms of difficulty, but overall they aren't overly challenging to solve. 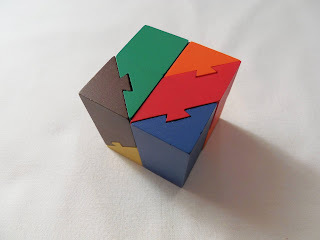 Before attempting to solve any of the other shapes, I first tried to reassemble it back into its cube form. This was the toughest of the challenges, also because it was the first time I was solving it. It must have took me about 30 minutes to have the cube shape again. 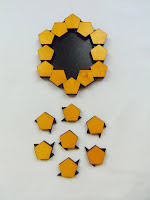 After that, the other shapes weren't that difficult to solve, and I managed to solve them within 10 minutes each. You can see three other shapes other than the cube in the photos below. Availability: You can get a copy of the Dragon Cube at PuzzleMaster for $20 CAD. Some of the best Hanayama Cast Puzzles have this fascinating characteristic of looking more like pieces of art than actual puzzles, and the Cast Harmony by Dmitry Pevnitskiy and Kirill Grebnev is certainly one of them. 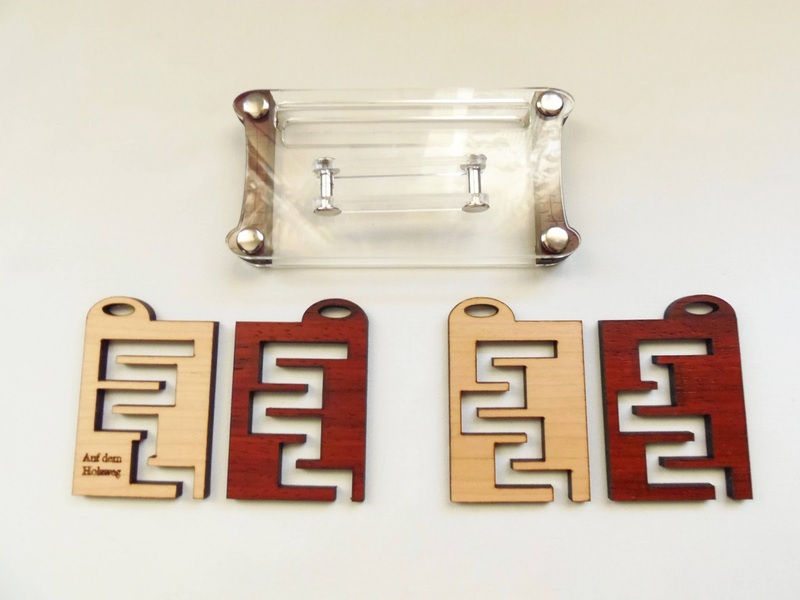 The Puzzlers' Award and Jury First Prize at the 2010 IPP Design Competition is also a good indicator of the Russian designers' excellence. 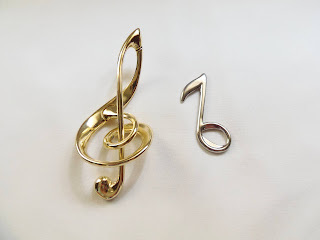 The Cast Harmony, here as a double meaning for the musical reference of the pieces' shapes and also for the beautiful harmony between the two pieces. 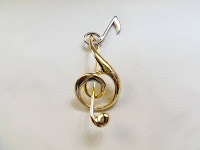 Represented are the G clef and the eighth note. Your task is to simply separate both pieces and then return them to their original position. This is not a hard thing to do, but the solution is quite elegant. 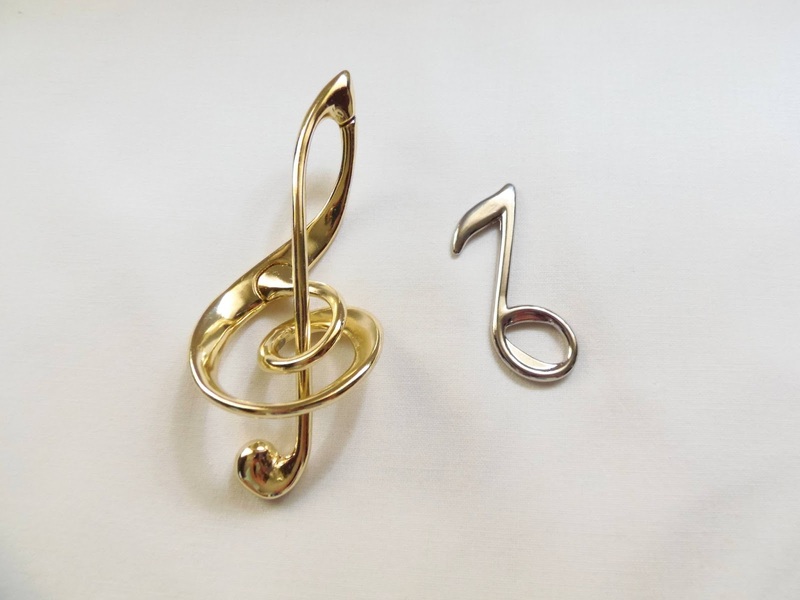 Just like most Cast Puzzles, the two pieces are coated with contrasting finishes, silver and gold. The Harmony is rated as a level 2/6, but even that seems too much, because I solved it within half a minute. I would've been quite disappointed if this wasn't a Cast Puzzle, but to be honest I didn't. With this design there wasn't much the designers could do to make it harder. The solution, of course, is very straightforward. The only part that seems slightly challenging is the spiral, which is where the note should pass in order to be freed. I hope I'm not giving too much away, but I believe anyone can figure out how to solve it just by looking at it. Curiously enough, even though it's a very easy puzzle, I find myself solving it all the time. It's such a beautiful puzzle and with a fitting solution, you feel the need to solve it "just one more time". 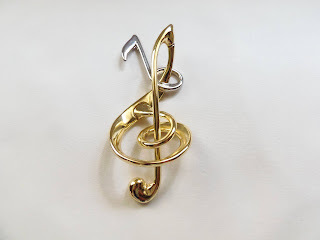 The Cast Harmony is easily one of my favorites from Hanayama now. I don't mind that it's easy to solve, at all. You don't need a tough challenge to enjoy a puzzle, as long as it is well designed and well built. Hanayama can launch all the easy puzzles they want, I will always be proud to add them to my collection. This is a must-have for any collector. Availability: You can get the Cast Harmony from Sloyd, in Finland. Worldwide shipping available. Rubik’s 360 was designed by the inventor of the famous Magic Cube, Ernõ Rubik, and released in 2009. Much different than its cubic predecessor, the Rubik’s 360 promised to deliver a completely new approach to puzzle solving. The design is very original indeed, unlike anything we ever saw from the Rubik’s company. But how does it stand with the current flood of new puzzles? Is it worth your time and money? Read on and find out. The Rubik’s 360 has quite a unique mechanism. 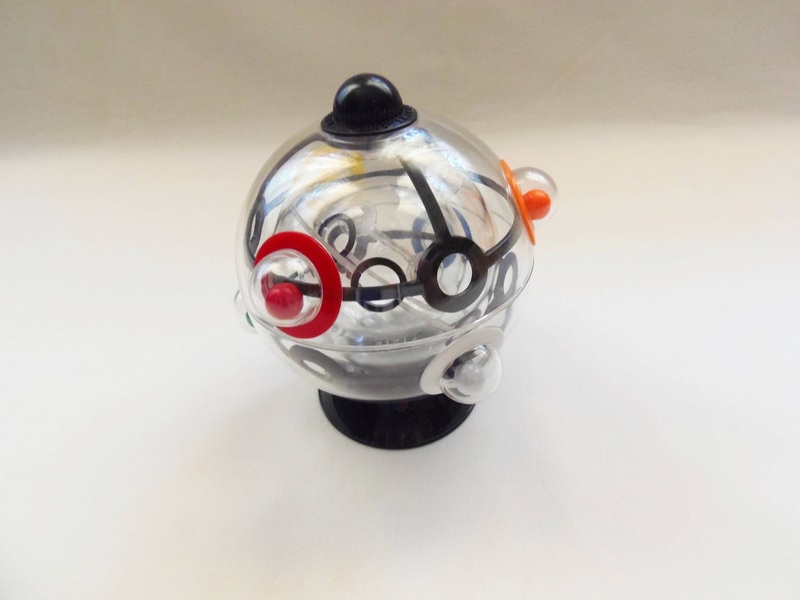 It is comprised of three transparent spheres, each moving independently from one another. The outer sphere is stationary in relation to the inner spheres. Also, you can only move the inner spheres by moving the outer one. Each of the inner spheres has a metal ball that acts as a counter-weight and makes the spheres rotate in the opposite direction. At the poles of the outer sphere you also see two knobs that rotate in order to open or close the entrances of the colored compartments. 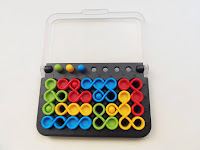 This helps to keep the balls in place while you try to get the remaining balls in the other compartments. The puzzle itself is nice to hold in your hands. It’s not very big either, with a diameter of about 11cm. 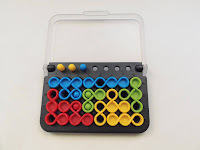 The goal of the Rubik’s 360 is very simple: There are six colored balls (white, blue, red, orange, green and yellow – the same colors of the original Magic Cube) and six compartments with the corresponding colors. You start by having all six balls at the center of the inner most sphere. 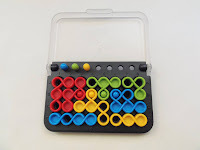 The goal is to get each ball to the compartment of the same color in the outer sphere. Getting the balls to where you want them is no walk in the park, though. It involves a good amount of dexterity… Actually, more dexterity than I would like. Prepare to some frustrating moments, because you’re going to need a lot of patience and practice to solve this the first time. As I said above, the two inner spheres move by getting the counter-weights in the desired positions. The inner most sphere has one hole and the middle one has two holes. Aligning the holes of the two spheres requires a lot of trial and error. 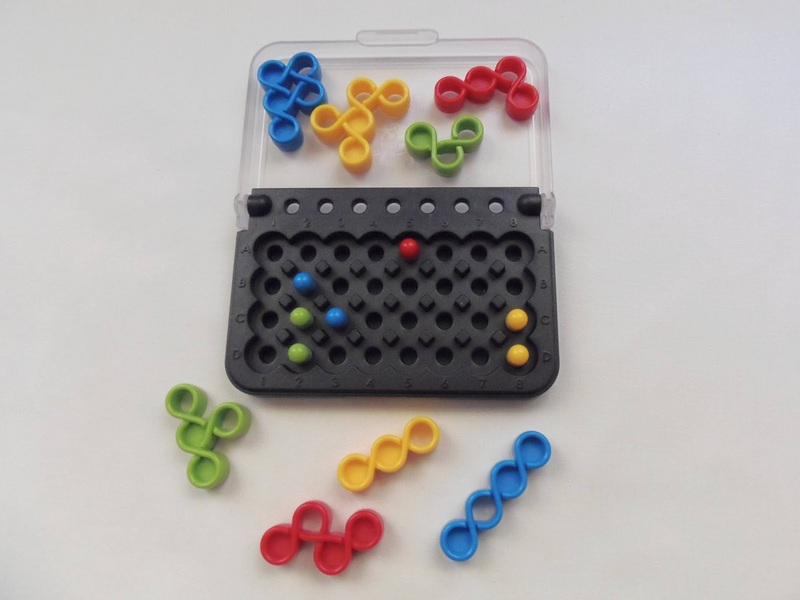 Sometimes you’re so close to get one of the colored balls in the corresponding compartment, just to see it fall to the center in the next moment. I have solved this over two years ago, and it required more than one attempt. I remember it took a lot of practice, but I eventually did it. I found the Rubik’s 360 quite frustrating to attempt to solve it a second time. It’s fun at first, but the fun is quickly replaced by frustration. The one thing that patient players get is a great rewarding feeling when they finally solve it. You really feel like you accomplished something challenging. So, is it worth your time and money? – If you like a serious challenge, absolutely! 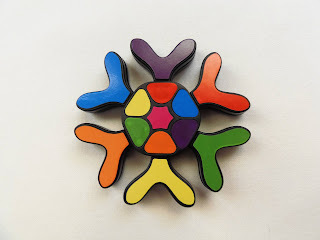 Availability: You can buy the Rubik's 360 at the Spanish puzzle store PuzzlesdeIngenio.com. 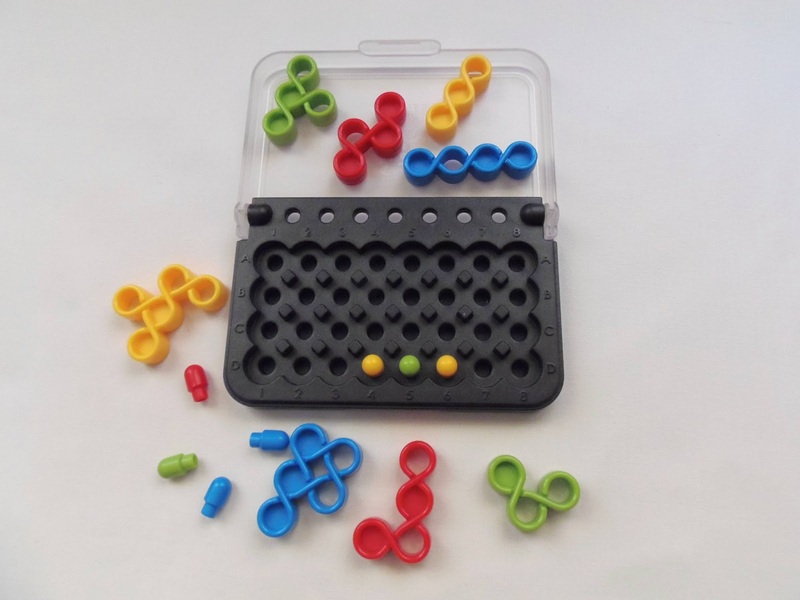 Floor is another unique Packing Puzzle from Jean Claude Constantin. This unusual mosaic is reminiscent of a honeycomb pattern, albeit having pentagons instead of hexagons. The puzzle itself looks like it consists of 19 pieces, but in reality only the inner 7 pieces are removable. The puzzle is made of three layers of what appears to be plywood. The top of the pieces are very well polished and feel smooth to the touch. Size-wise it's a small puzzle, measuring only 12 x 10.5cm (4.7" x 4.1"). The pieces of the Floor puzzle are also very unusual. Each piece has two layers: the first layer is a simple pentagon, but the second layer is a combination of three spikes, with each piece displaying a distinct arrangement. When solved, the triangular spaces you see between the pentagons should be occupied by these spikes. No empty spaces shall be seen, otherwise the puzzle remains unsolved. The floor puzzle is deceptively easy. 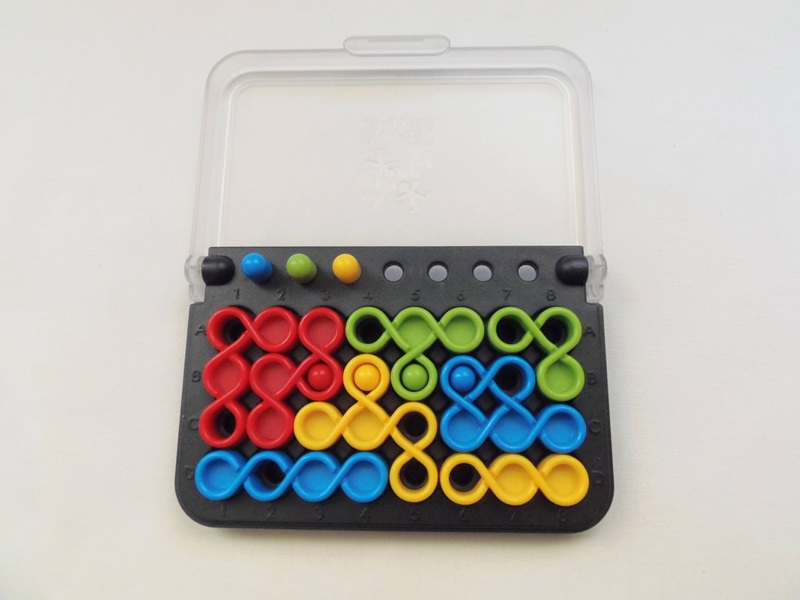 At first sight, it looks quite intimidating, given the strange appearance of the pieces, when in fact it's solvable within 10 minutes or so. It's rated as a level 7/10 by PuzzleMaster, and I have to agree. It's not very challenging. When you place the first piece in the tray, just make sure its spikes cover the empty spaces shared by the frame. From there on, I just placed the remaining pieces, always keeping in mind not to leave empty spaces. I was able to solve it without removing any piece previously packed. I'm not sure if the puzzle has multiple solutions, but seeing how easy it is to solve, I reckon it's safe to assume it should have at least a couple more of them. The Floor puzzle is a nice puzzle to have around. It's not very demanding, but its design is quite intriguing. 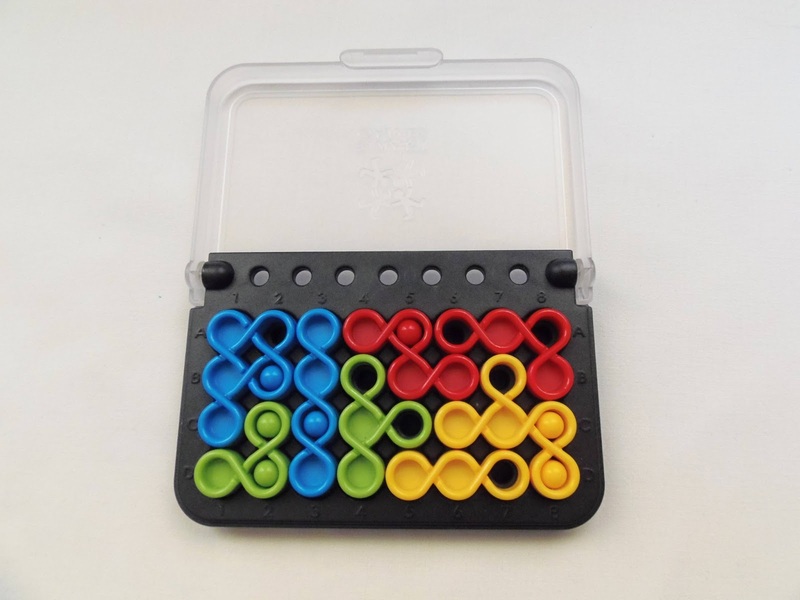 You can try to solve it more than once as well, because it's a little hard to remember the exact arrangement of the pieces in the tray. 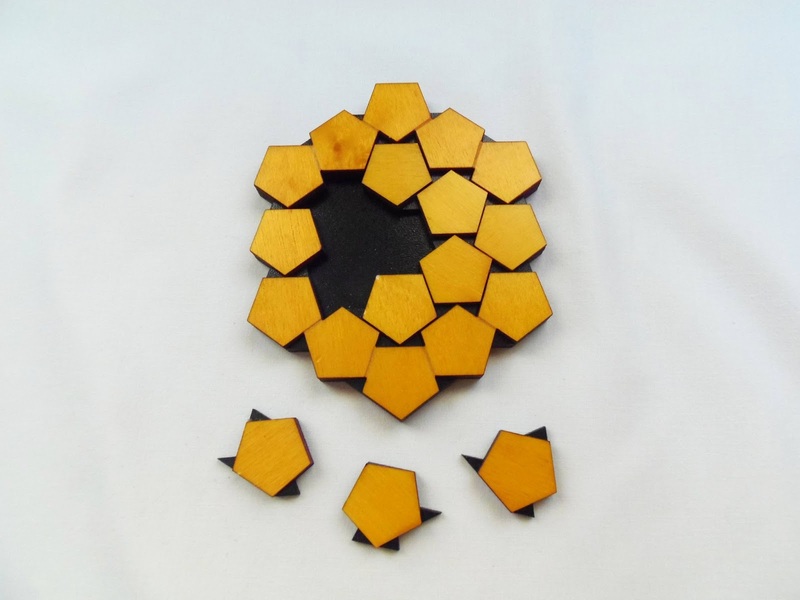 Availability: You can buy the Floor puzzle at PuzzleMaster for about $20 CAD. Take a look here to browse other puzzles from Jean Claude Constantin. Ever dreamed of building brick walls? 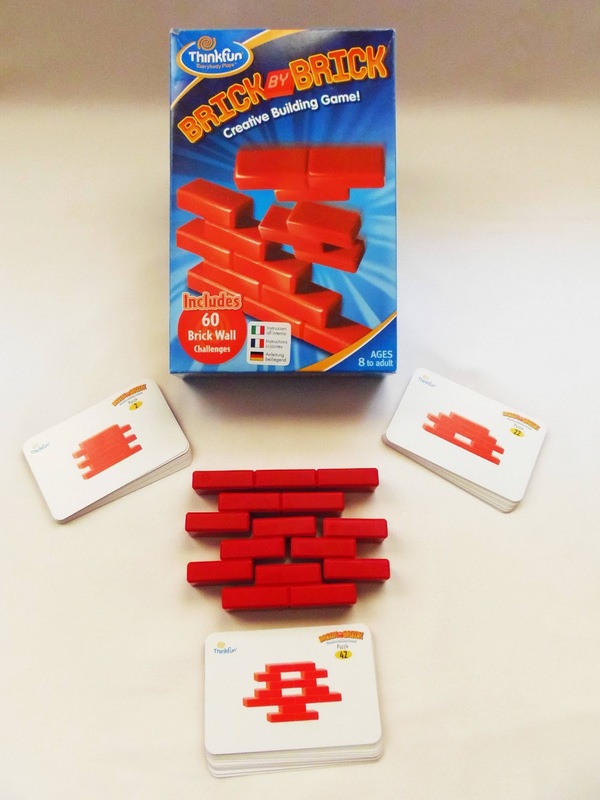 - Me neither, but ThinkFun's Brick by Brick promises to make that task quite fun indeed. First introduced in 1990, when ThinkFun was known as Binary Arts, this game was relaunched in 2007 along with other classics. The puzzle is comprised of only five different pieces, but the possibilities are endless. Included with the game are 60 challenge cards, each with a different symmetrical shape you must assemble from the five pieces. 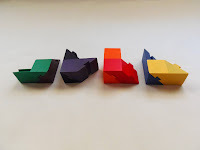 The game was likely inspired by another classic, the Tangram, where you also had to build shapes using the same seven pieces. 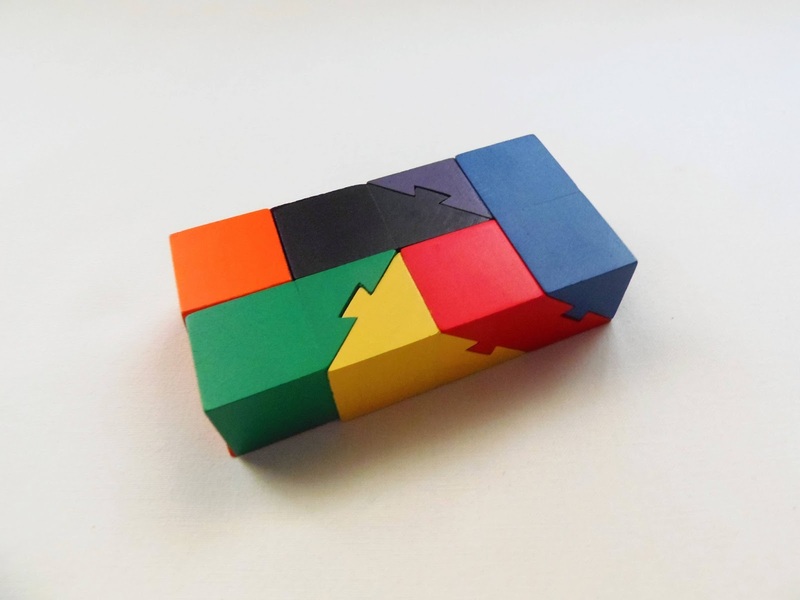 The design of the puzzle is as simple as you can get, but true to its name. 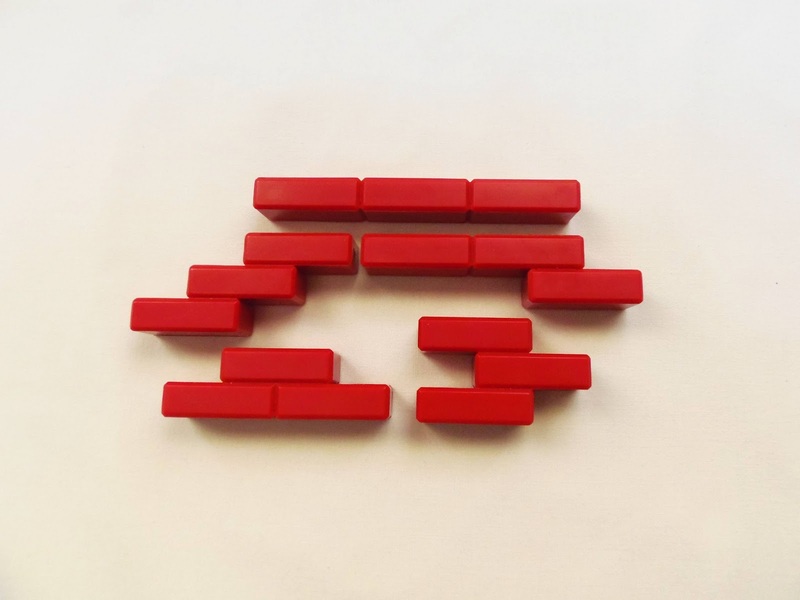 The pieces are made from plastic with a deep red tone, closely resembling the actual color of bricks. This is basically a 2D puzzle, but you can try to solve the challenges in a vertical position, as if you were building a real brick wall. 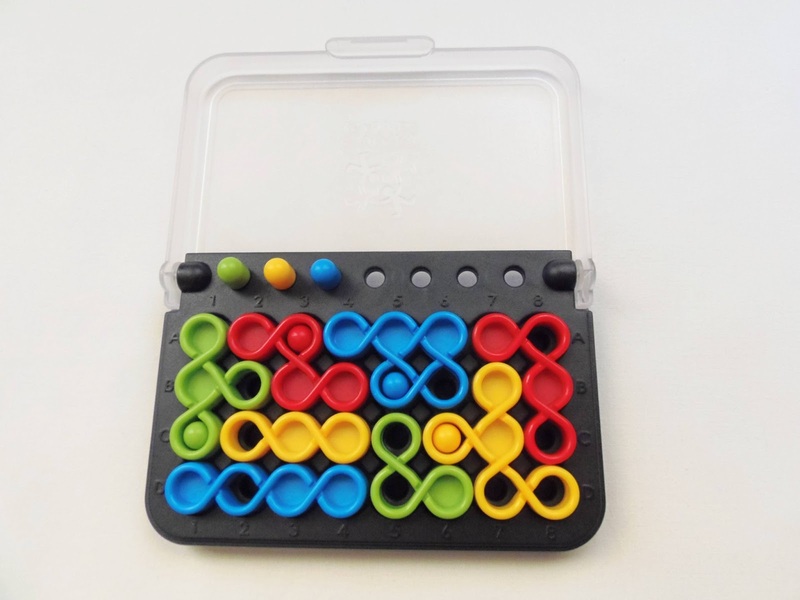 I love puzzles like these, not just ThinkFun's but from other brands as well, like Popular Playthings or Smart Games. The main reason is because you get to play with them much longer than any other regular puzzle. They always include dozens of challenges, which depending on your free time, can take quite a while to tackle them all. Some of the puzzles, however, even with lots of challenges and different levels of difficulty, are still pretty easy for the more experienced puzzler. My opinion, though, even if they're easy to solve, is that they're always extremely fun to play with, and that's what really matters. 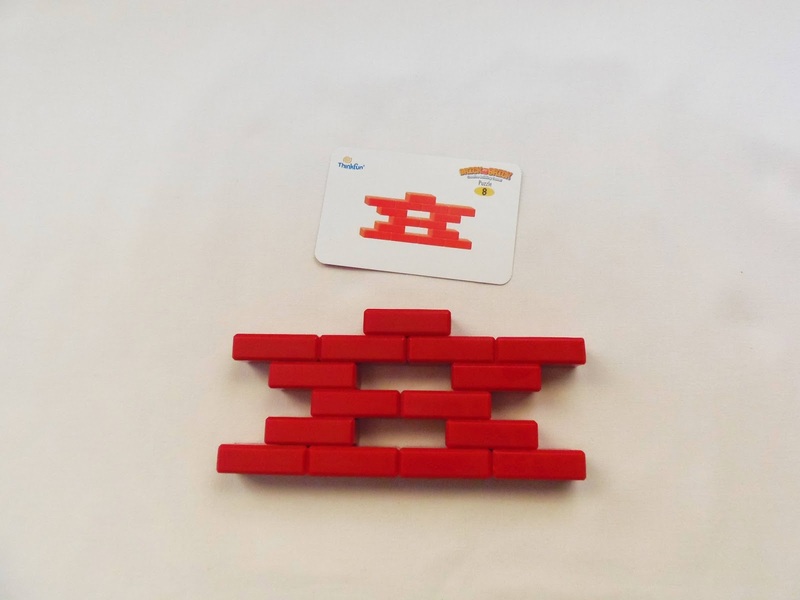 Brick by Brick, like it or not, falls into the category of those easy puzzles. 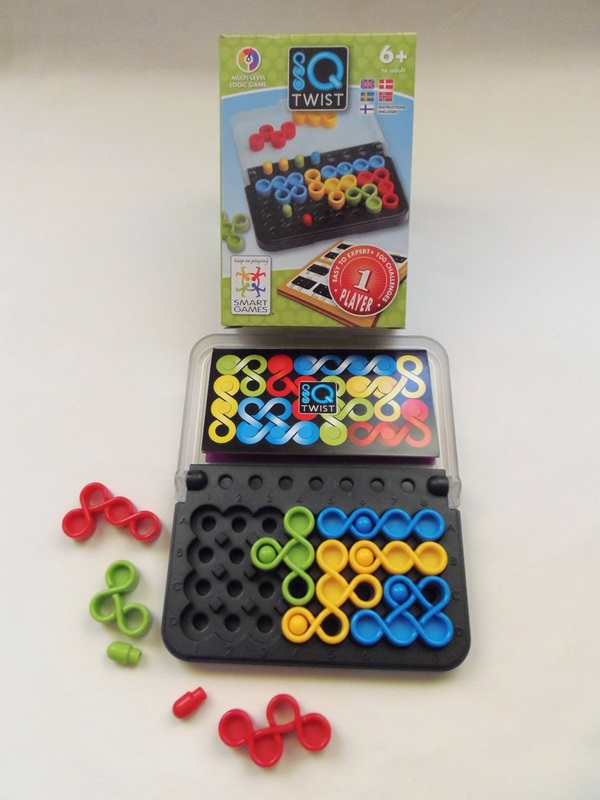 Unlike others in the ThinkFun range, the included 60 challenges aren't divided into difficulty levels. From my experience, this meant that trying to solve one of the later challenges wasn't harder than the first ones. They're just different shapes, and once you get the hang of it, doesn't matter which one you end up choosing to solve, because they're pretty much the same level. You can find the solution to each puzzle on the back of its corresponding card, but I reckon you won't be needing them that often. Brick by Brick may not be your ultimate challenge, but I guarantee you, no matter how skilled you are at solving puzzles, you'll most certainly have a good time with it. The 60 challenges will sure keep you busy for a while. 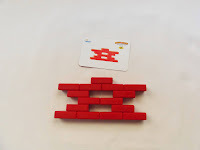 Availability: You can find the Brick by Brick game at Sloyd.fi for about €18. 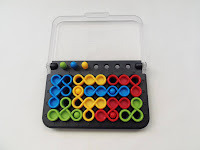 Other similar games are also available, such as the Block by Block, Shape by Shape or the Square by Square. 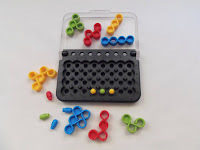 Burr Box is a deceiving name for an Assembly puzzle. When you think of the word Burr, you immediately think of Interlocking puzzles. However, the concept is quite interesting, although not entirely original, since I've seen a few similar designs. 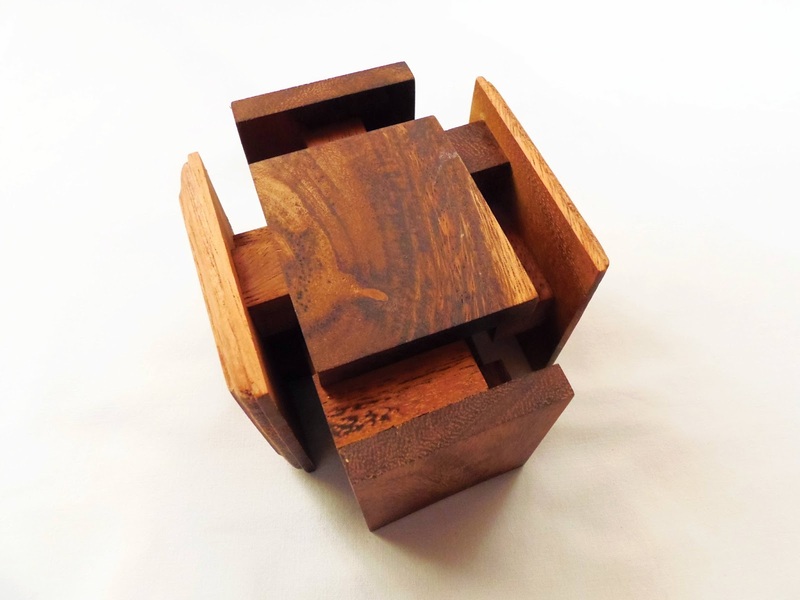 The Burr Box reminded me of Brian Young's Insoma, a 2-in-1 puzzle. The puzzle is presented as a closed box, and at first sight it doesn't let you see very much. It's only when you first try to open it that you are surprised with a Soma-like puzzle inside. Each of the six faces of the cube have pieces attached to them that form a solid cube when assembled. The goal is to take it apart and try to put it back together. I don't have much information about its designer, unfortunately. This comes from Brilliant Puzzles and it's actually very well built. The wood is polished and the edges of the cube's faces are beautifully crafted. The size is just right to maneuver it in your hands, measuring 8 x 8cm (3.1" x 3.1"). This actually looks more intimidating than it actually is. Taking it apart is very easy, since it practically falls apart when you pick it up. You need to be careful not to accidentally take it apart when you don't want to. 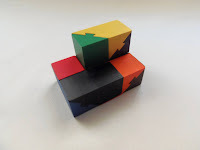 The real challenge comes when you try to put it together, but even this won't be that much more challenging than solving an actual Soma Cube or one of its closest counterparts. It's rated as a level 4/5, but to me it's more like a 3.5/5. The assembly might be a little tricky sometimes, because it's harder to see the empty spaces with the bulky cube's faces in the way, as you try to solve it. When fully solved, the inner cube can't have empty spaces. The Burr Box is very pleasant to play with. The added complexity to a known puzzle type feels refreshing and rewarding to solve. Because of the puzzle's nature I reckon it might have only one solution, but don't take it as a fact, it could have a couple more that I'm unaware of. Either way, I can easily recommend it to anyone with a keen mind for puzzles. 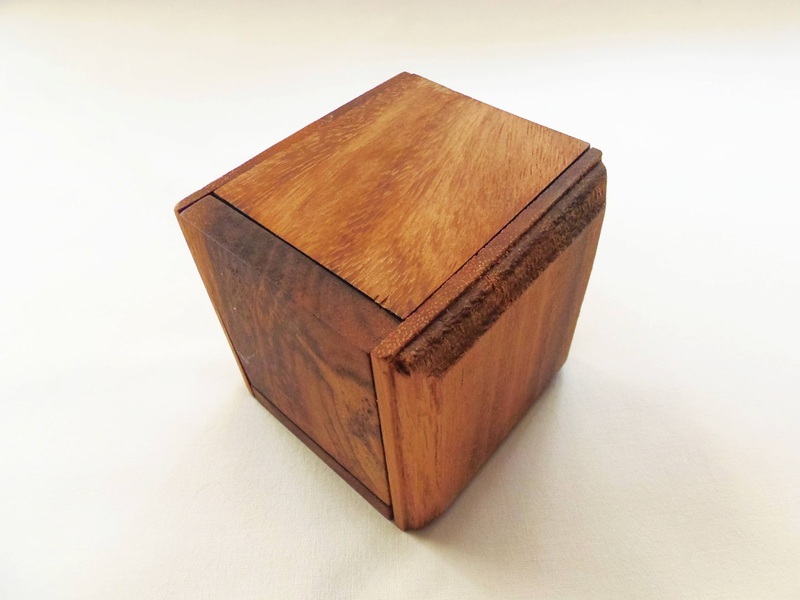 Availability: You can get a copy of the Burr Box at Brilliant Puzzles for about $13 USD. 2D Packing Puzzles allow for some of the most creative works in puzzle design. This type of puzzles is so versatile that you can do almost anything you can imagine. A great example of such creative design is Martin Watson's Digigrams (also called Count on Me!). Digigrams is comprised of 10 pieces representing the numbers in digital form from 0 thru 9. The goal is simple: just pack them into the provided tray. The solution is neatly packed to make the most out of the available space, due to the unusual shape of the pieces. 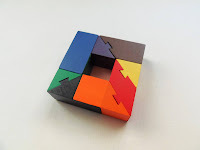 The puzzle is manufactured by Creative Crafthouse, and as you can read from some of my past reviews on their puzzles, their craftsmanship is superb. The hardwood they use is very high quality, and in this case there are two tones, light and dark. The size is satisfactory, with measurements of 14 x 12 x 2.5 (5.5" x 4.7" x 1"). Comes in the classic base and cover design. The Digigrams is not an easy puzzle. It's actually quite challenging, although it never reaches frustrating levels like the Calibron 12, for example. Be warned, though, as the puzzle comes in its solved state. If you don't want to spoil your experience, open the box facing down. It's very easy to "almost" solve the puzzle, since you can get the first five or six pieces pretty easily inside the tray. However, there's always some pieces that refuse to be packed. 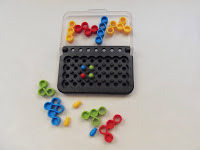 At first, it's hard to see how the pieces should be placed next to each other, but you'll soon understand how they interact - That's only a small part of solving the puzzle, because the hard part is discovering the actual solution. Just before when I was ready to be done for the day, I was able to finally solve it. It had taken me approximately an hour and a half to do it. Solution: If you need help with the solution, you can see it solved here. Packing Puzzles are easily among my favorite type of puzzles. The Digigrams is very close to the limit of what can be considered an extremely hard puzzle. PuzzleMaster rates it as a level 9/10, which is exactly what I think about its difficulty. The quality is remarkable, so if you're looking for a good challenge, this one is a perfect fit. Availability: You can find the Digigrams (Count on Me!) at PuzzleMaster for about 20 CAD. For other puzzles in the Creative Crafthouse range check out their dedicated page. This brilliant design from Jean Claude Constantin, Die Welle, which can be translated as The Wave, is a fascinating puzzle from the long family of n-ary puzzles (sequential movement). 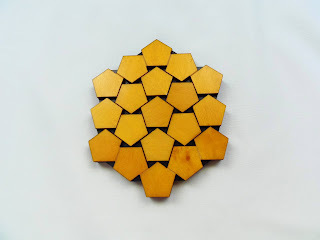 Goetz Schwandtner has a whole page dedicated to this type of puzzles, as well as a comprehensive analysis of them in a downloadable .pdf. Definitely worth taking a look. 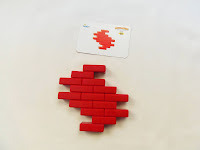 Die Welle, which falls into the category of quinary puzzles (5-ary), has something about its design that makes it very original and totally different from its counterparts. Instead of the usual straight paths with 90º turns you have three wavy paths with curved turns. The principle is the same, but the execution and solving process provides a somewhat different experience. While the straight path puzzles have you moving the balls sequentially back and forth on a stationary frame (not all of them, but the majority), it's the complete opposite with the Die Welle. The frame moves up and down to make the balls move from one end of the puzzle to the other. The goal is to take out all three balls at the same time. This is not as simple as it sounds. At first sight, the three waves appear to have the same lengths, when in reality the path traversed by the balls is longer at the bottom wave than the top one. When you're done, try to solve it backwards by returning the balls to their original positions. 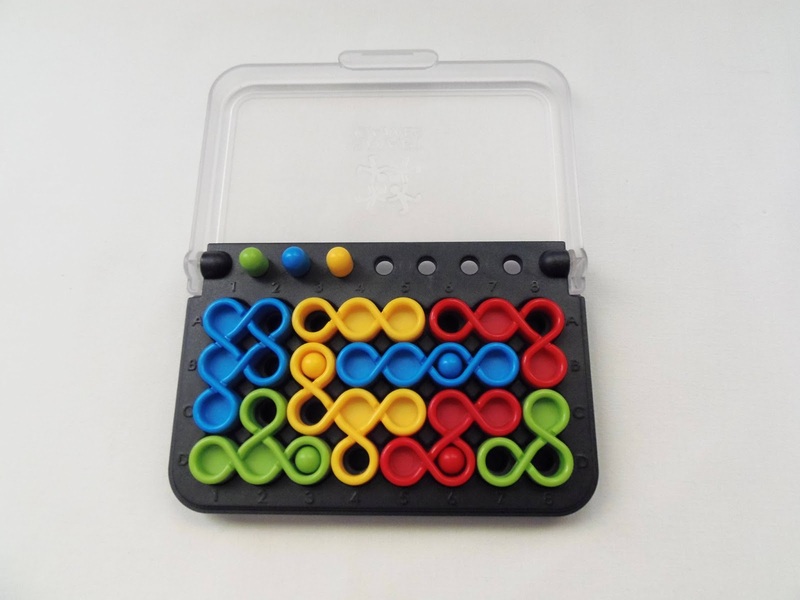 The design of the puzzle is very attractive, artistic in a way. 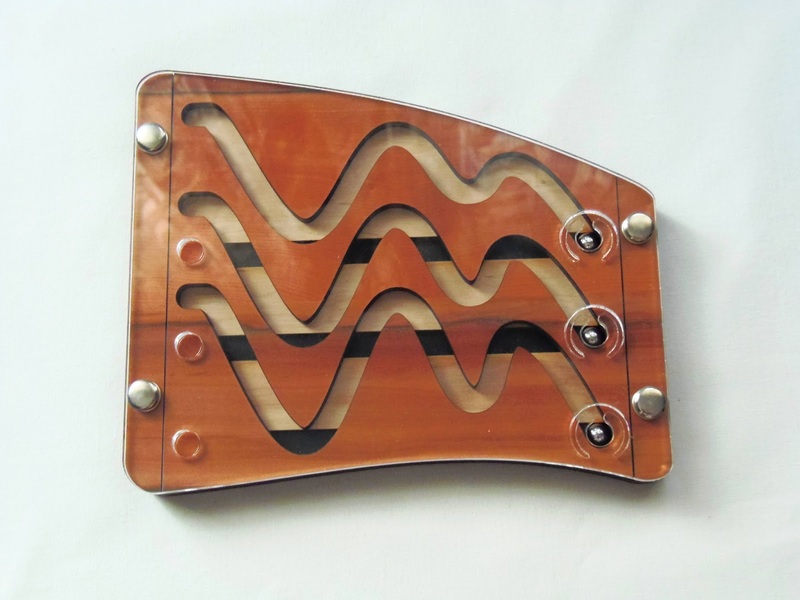 The wavy pattern adds an elegance to it. The frame is covered by an acrylic sheet with the rest being three layers of plywood. I was pleasantly surprise by its size as well. 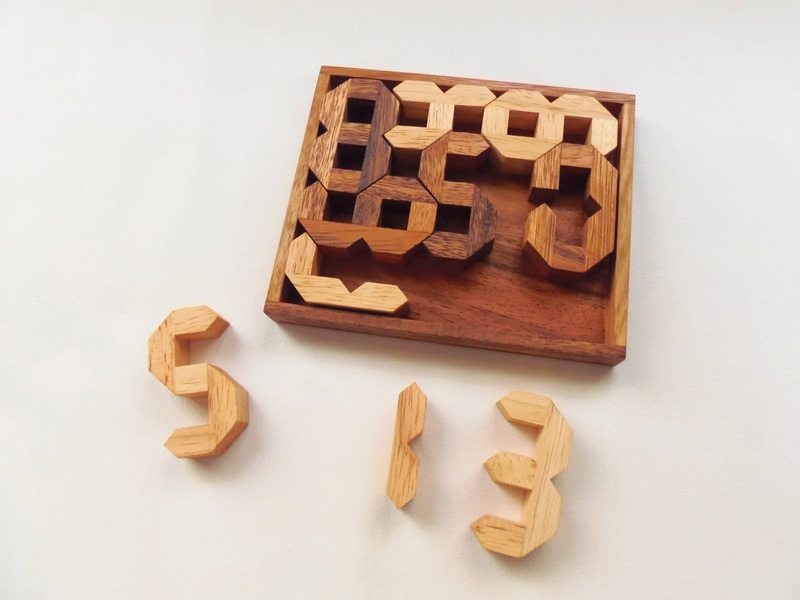 It's rather big for this kind of puzzles, with measurements of 17 x 14 x 1.6cm (6.7" x 5.5" x 0.6"). Regarding difficulty, it depends very much if you've previously solved any n-ary puzzles. I have solved a few of them before and didn't have much trouble solving this one. I reckon it took me about 10 minutes to solve it the first time, and a little less to put it back in its original state. 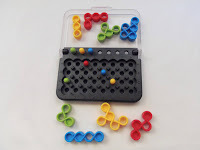 Once you understand the sequence of the first steps, which require you to go back and forth with the first two balls to make the last one move forward, you just need to keep at it until you get all three on the other side. I should point out that the movement of the wooden frame is not very smooth, it jammed quite a bit. I got the hang of it after a while, but it's still a bit annoying. 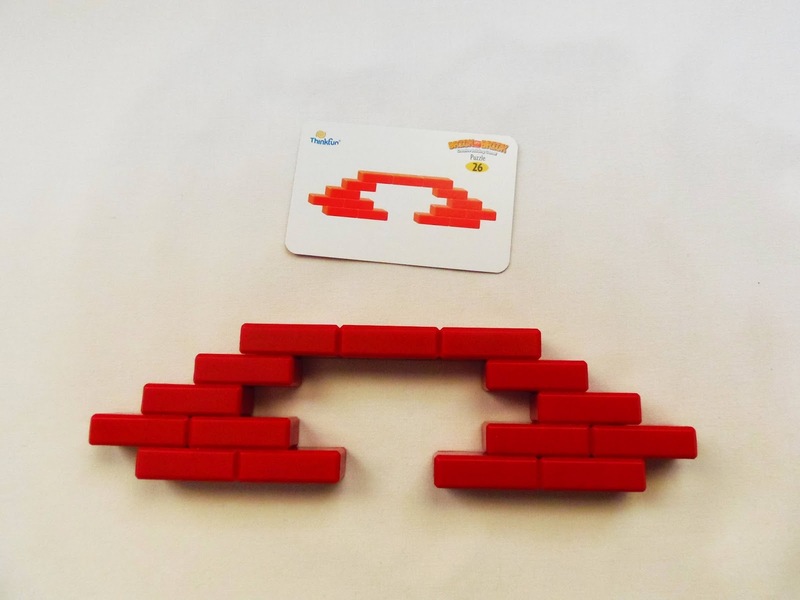 Die Welle, despite having a so-so movement, is a fantastic puzzle. The challenge, compared to others in the n-ary family, is very accessible and even beginners won't have a very hard time with it. Its strongest selling point is definitely the design, which is gorgeous and a must-have in any collection. Availability: You can buy the Die Welle (The Wave) at Sloyd.fi for about €22.